Video surveys are proving increasingly popular in the removals industry. 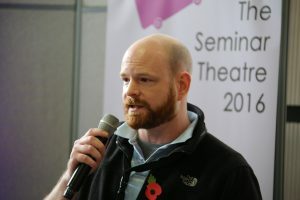 In this article, Damien Seaman (pictured delivering a seminar at last year’s Movers & Storers Show) from Buzzmove – which launched their Gobuzzsurvey video solution earlier this year – explores the benefits of the new technology. The removals industry doesn’t have a great reputation for innovation. But video surveying seems to be the exception. Here’s why recorded remote video chat is making waves, and why you should consider trying it in your own business. “Corporates also want their moves to be trackable,” adds Phil Oakey from Gerson. “Having a video record of what was agreed at the time of the survey helps the client to understand and review every aspect of a move.” Louis Spies from White & Company said his firm was eager to start using video surveys for European moves. Another company said that just offering video surveys could help win relocation contracts from big corporates – especially in the tech sector. Every company we spoke to anticipated that their use of video surveys would increase in the next six to twelve months. One of them said they planned to use video for up to 90% of booked moves and 60% of quotes. Yet companies were also clear that video would not replace traditional physical surveys. Reducing survey costs was also a major benefit for the companies we spoke to. Estimates of video survey costs varied, from £50 all the way up to £250-£300 per survey, depending on distance. “With video we could do 6… 10 surveys a day. Perhaps 12. Depending on the nature of the video survey, the time it takes to review and write up afterwards,” said one. Just last year, video surveys would cost you $25 (£20) per survey, or $90 (£72) for a survey plus cubing. Now, thanks to more competition, the price has come right down. It now averages £10 – £16 per survey, £25 for a full service option where the provider does it all for you, and £48 for a survey with automated cubing. Depending on which provider you choose.